Camp Takodah will feel like your home away from home! 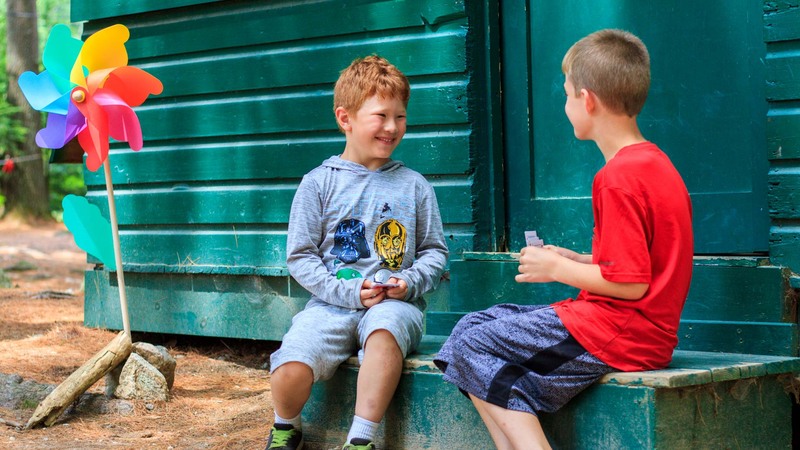 Campers receive their cabin assignments when they arrive at camp. Each cabin has 10 campers and two college-age cabin leaders. We carefully place campers in cabins with kids of the same age and gender. Campers are even welcome to request one cabin-mate (friend from home), who can provide a safety net for kids who are a little nervous about camp. We search long and hard to find the best college students to be our cabin leaders. They play the role of leader, big brother/sister, role model, cheerleader, and hero — all in one. Cabin leaders greet campers with a big smile on their first day of camp, and they spend the rest of the session making sure campers have a safe, fun, and rewarding experience. Campers live in a cabin with nine other campers — and cabin-mates quickly turn into family. No matter how many years campers return to Takodah, there are always new friends to make. Campers, staff, and alumni agree: Takodah friends turn into best friends for life, and those friendships start with cabin-mates. It’s important to us that campers feel comfortable at Takodah. Our cabins are cozy, rustic, and well maintained. All cabins have electricity and screened windows for fresh breezes. Campers sleep in a twin-sized bunkbeds with comfortable mattresses. Every cabin is a few shorts steps from a modern bathroom and shower facility.